In recent weeks, China's government made it clear that any meeting between President Obama and the Dalai Lama threatened to further damage already tense Sino-U.S. relations. But after the President held an hour-long talk on Thursday at the White House with the exiled Tibetan spiritual leader, the reaction from Beijing was relatively muted. Chinese Foreign Ministry spokesman Ma Zhaoxu issued a written statement, saying, "The United States' behavior constitutes a serious interference in China's internal affairs and seriously hurts the feelings of the Chinese people and seriously harms Sino-U.S. relations." The comments are in line with what Chinese diplomats have said after the Dalai Lama met U.S. leaders in the past, during warmer times between the two nations. Part of Beijing's restraint this week may be due to the fact that the meeting came during the Chinese New Year, the country's biggest holiday, when most officials are on leave. But after China allowed a U.S. Navy aircraft carrier to visit Hong Kong this week, China is sending signals that it doesn't want ties to decline too sharply. 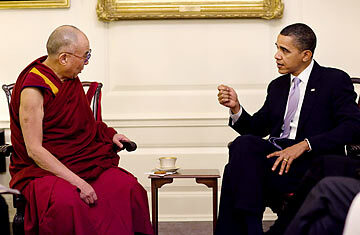 The U.S., on its part, also took steps to ensure the meeting with the Dalai Lama wasn't overly inflammatory to Beijing. Their session was held in the low-profile Map Room of the White House and no television cameras were allowed in. The location and the restrictions on press coverage  the President's press office provided only a still photo after the meeting  signaled that the Administration wanted to avoid giving the impression it considers the Dalai Lama a head of state. "The President stated his strong support for the preservation of Tibet's unique religious, cultural and linguistic identity and the protection of human rights for Tibetans in the People's Republic of China," White House press secretary Robert Gibbs said. Obama came into office emphasizing the importance of diplomacy, and last year Secretary of State Hillary Clinton said the U.S. wouldn't allow human-rights issues to derail cooperation with China on other fronts, like stabilizing the global economy. Last fall Obama delayed meeting with the Dalai Lama when he was in Washington to avoid angering China ahead of his first visit to the country. That move was criticized by some as too deferential, as was Obama's approach to human-rights issues during his three-day trip, which Chinese activists called disappointingly limited. But recently the White House has emphasized a tougher stance toward China. After Google indicated that it might end some of its China operations due to hacking attacks and official censorship, Clinton sided with the U.S. media giant and called on China to investigate the attacks. In early February, Obama said the U.S. would press China on its currency, which economists say Beijing keeps undervalued to boost Chinese exports. This month, the President also approved the sale of $6 billion worth of arms to Taiwan, which China considers part of its territory. That provoked further anger from Beijing. Three senior Chinese military officers were quoted in an official newspaper suggesting that the government should sell some U.S. Treasury bonds in retaliation. China's holdings of U.S. government bonds did drop by 4% to $755 billion, the U.S. Treasury Department reported this week, but those numbers are from December, before the recent downturn in ties. China's vast holdings of U.S. debt give it only limited leverage, because any partial sell-off would harm the value of its remaining U.S. assets. Dumping Treasuries would also undermine the American economy, further dampening the market for Chinese exports. So even as the U.S. and China find a growing number of issues over which to argue, their economic interdependence helps keep the disagreements from spiraling out of control.